Named the #1 band to follow by Come To Woodstock magazine, Lara Hope & The Ark-Tones are the Hudson Valley's premier rockabilly, rhythm & blues, retro rock n' roll outfit. 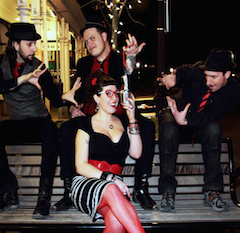 With the release of their fully crowd-funded debut album, Luck Maker, a music video for their single Whiskey Pick (official selection of the Woodstock Film Festival, and in WDST's top 100 songs of 2014) and a relentless performance and touring schedule, it has proved to be an exciting time for the Ark-Tones. Born from a hybrid of Lara's former Rockabilly band The Champtones, and upright bassist Matt's international Psychobilly act The Arkhams, The Ark-Tones hit the ground running in 2012 with the addition of Chris Heitzman on guitar and Dave Tetreault on drums. This fun-loving bunch packs the dance floor with their own original musical offerings in the vintage style, as well as re-workings of Rockabilly, Rock 'n' Roll and Rhythm & Blues classics and standards.